The prayer itself is a recollection of the angel Gabriel's visit to Mary to reveal to her that she had been chosen to bear the Christ child. It included the angel's declaration to Mary (‘And be­hold, you will conceive in your womb and bear a son, and you shall name Him Jesus,’ Luke 1:31), her response to this news­ (‘Behold, the bondslave of the Lord; may it be done to me accord­ing to your word,’ Luke 1:38), and a meditation on the Word made flesh from John 1:14 (‘the Word became flesh, and dwelt among us, and we saw His glory, glory as of the only begotten from the Father, full of grace and truth’) interspersed with the response of the ‘Hail Mary’ prayer. Before proceeding, take a few moments to look carefully at Millet's The Angelus. Allow yourself sufficient time to enter the picture and notice as many of its features as you can. Be still before it, as if you too have just now heard the church bells ring, calling you to prayer. The painting presents two peasants in a field near the close of day. We see the faint outline of a city behind them in the distance. This is a moment of deep and quiet reverence. All work has abruptly stopped as both the man and the woman stand in bowed silence. The man, hat in hand, stands in devout humility and worship. The woman also bows her head, her hands tightly clasped in prayer close to her chest. It is an intensely private moment for each of them, yet their shared prayer unites them together in a holy alliance where God is present. Notice the setting in which these two figures stand. At their feet is a large basket of potatoes. Beside the man is his pitch­fork, stuck upright in the ground. Behind the woman stands a wheelbarrow with bags containing the fruit of their labours. In the misty distance we can see the spire of the village church emerging from the horizon. It could have been the bells from this steeple that summoned these people to prayer and announced the good news of the Word become flesh. The sky is golden with the light of the evening sun and barely visible birds flutter away in the right corner of the painting. Everything in this work invites us to stillness and meditation. The figures are immobile. The tools of their trade are abandoned. The landscape is completely flat and there is no movement at all, except for the barely visible birds in the distant sky. Time almost seems to stand still, and we become aware that this moment is special and sacred. For these people of prayer, with the eyes of their heart turned toward God, the world has grown dim, dissolved in heav­enly light. The blaze of light behind them, symbolic of the radiant glory of God, seems to transfuse their humble daily tasks with dig­nity and nobility. The warmth of the glowing evening sky that envelops this couple also reaches out to invite us to rest for a moment from our busy activities and turn our attention to God. Looking at this piece of art I find myself caught up in the quiet spaciousness of God's mercy and love. The devotional stillness and focus of the two figures draw me into silence. I feel attracted by the kind of faith shown here in these farmers. They invite me to take more frequent brief moments to look into the face of God. 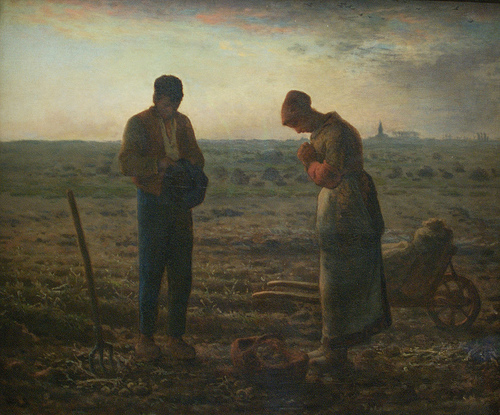 Jean-Francois Millet: The Angelus (1857-1859), oil on canvas, 55.5 x 66 cm, Musée d'Orsay, Paris. Jean-Francois Millet(1814-1875)was born into a French peasant family, his parents working long hours each day as labourers in the fields. His love of nature and the Bible were instilled by a devout grand­mother and parents who nurtured him in the faith. Millet was particularly attracted to the beautiful engrav­ings in the family Bible, which became the inspiration for many of his paintings. His talent was recognized by his father and the parish priests, who provided him with the advantages of an excellent education. Steeped in mythology, Greek and Latin, Shakespeare and Milton, the literature of the classic spiritual mystics, and the Bible (which he called ‘the painter's book’) Millet was urged by his family to grow in his faith and to live so that ‘all your desire should be to praise God by thought, word and deed.’ His grandmother was a source of particular spiritual encouragement, telling Millet to ‘paint for eternity ... and to never lose sight of the presence of God.’ Many of Millet's paintings depicted the life of the peasant, causing him to be often called ‘the peasant painter.’ The painting we are considering is very much a reflection of his personal childhood experience of observing this traditional prayer of his faith and culture. Juliet Benner is an international retreat and workshop leader who speaks frequently in Australia, New Zealand and Hong Kong. She is a trained spiritual director and has served as a consultant in art and spirituality at the Carey Centre on the campus of the University of British Columbia (Vancouver). She lives in Victoria, B.C., Canada. She was trained as a visual artist, so when she became a spiritual director, she found it natural to begin showing people how to meditate on Christian art treasures that are rooted in a passage of Scripture. She teaches a way of encountering the Word behind both the words of Scripture and the artist's meditation on Scripture.